In June 1955 a committee was appointed to design a Seal for the State Association and a Badge that would be recognized statewide. 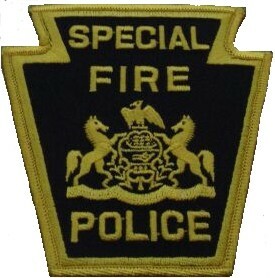 The final sketch was selected as the official seal and the official badge of the Pennsylvania State Police Association. The only difference between the seal and the police badge was made by removing the words "Deo Volente" (God willing) from the seal and inserting the words "Fire Police" for the badge. Incorporated in the badge and seal is the spirit in which the Association was founded. The triangle signifies man's dependence on a Supreme Being and the completion of the firefighting organizations of Pennsylvania, the Firemen, the Fire Chiefs and the Fire Police. On the outer half of the triangle are the words - "Fidelity" - "Protection" and "Assistance". Directly below the triangle are the words "Deo Volente". This part of the triangle has a significant meaning to all Fire Police, namely - "God willing they will be faithful to their association and give protection and assistance to their fellow man." In the circle around the triangle are the words "Servants of Brotherhood." This signifies that the Fire Police have volunteered their service to their fellow man in time of need. Whether it be time, money or their life, if necessary. In the center of the triangle is the year the Association was incorporated in Lancaster County, 1949.